We are convinced that technology has changed our lives for the better, and the 2018 Ford Focus St is changing with the times. Starting at an affordable price, this beautifully crafted compact performance hatchback is exuding a wonderful presence. 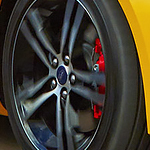 The 2018 Ford Focus ST is a real present for the holidays because it is equipped with an intelligent Push-Start Button that does not require the keyfob to be inserted into the vehicle. All signals are sent wirelessly. If you sign up for the FordPass, your life will be easier with this app that can pay for parking ahead of time, compare the fuel prices at different gas stations on your way to your destination, and get help from the FordGuide about different places you want to visit. The 2018 Ford Focus St will make an excellent driving companion. Come to our Tracy Ford dealership today to set up a road test of this wonderful vehicle.